2 Ramen has acquired the reputation of being a classic edible staple of the college student. These fried noodles packaged in crinkly, hot pink cellophane have much to offer to the student budgeting their time and grocery money. 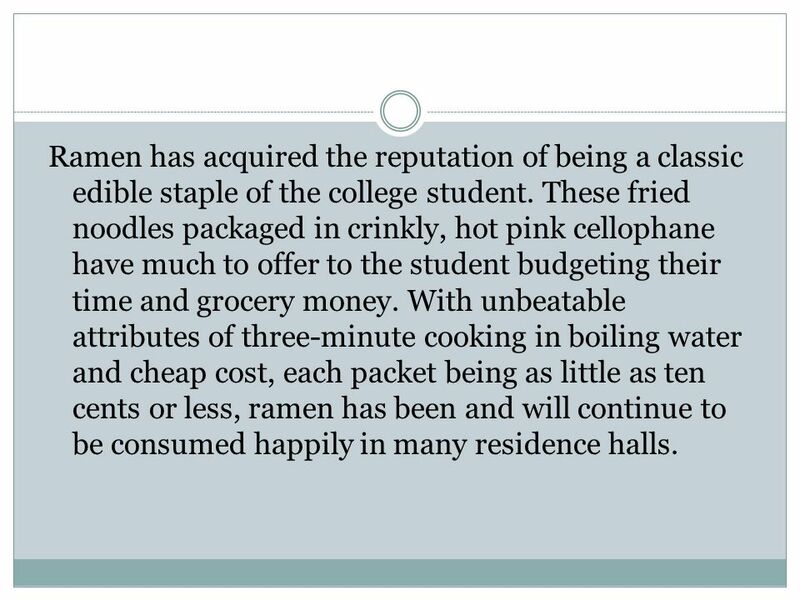 With unbeatable attributes of three-minute cooking in boiling water and cheap cost, each packet being as little as ten cents or less, ramen has been and will continue to be consumed happily in many residence halls. Ramen doesn’t have to taste the same all the time! Try tossing out the flavor packet and trying on of these recipes. 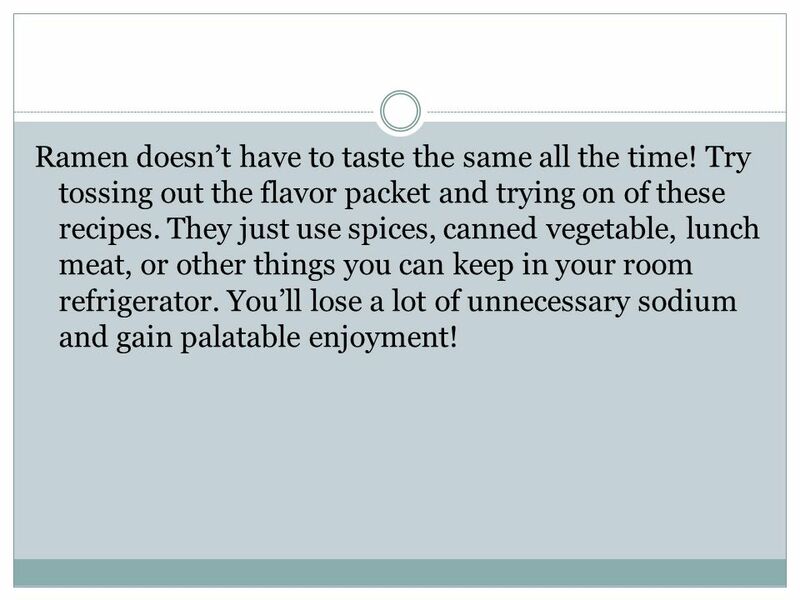 They just use spices, canned vegetable, lunch meat, or other things you can keep in your room refrigerator. You’ll lose a lot of unnecessary sodium and gain palatable enjoyment! 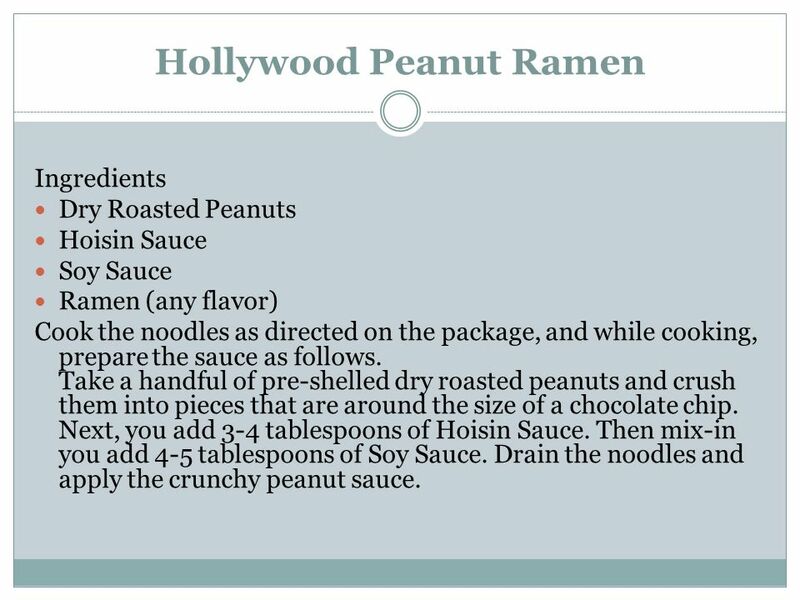 Ingredients Dry Roasted Peanuts Hoisin Sauce Soy Sauce Ramen (any flavor) Cook the noodles as directed on the package, and while cooking, prepare the sauce as follows. Take a handful of pre-shelled dry roasted peanuts and crush them into pieces that are around the size of a chocolate chip. Next, you add 3-4 tablespoons of Hoisin Sauce. Then mix-in you add 4-5 tablespoons of Soy Sauce. Drain the noodles and apply the crunchy peanut sauce. 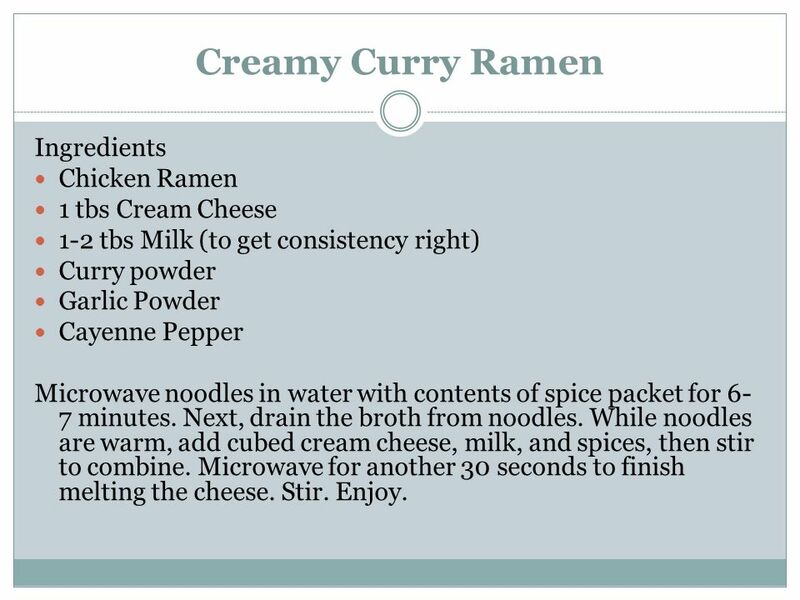 1-2 tbs Milk (to get consistency right) Curry powder Garlic Powder Cayenne Pepper Microwave noodles in water with contents of spice packet for 6-7 minutes. Next, drain the broth from noodles. While noodles are warm, add cubed cream cheese, milk, and spices, then stir to combine. Microwave for another 30 seconds to finish melting the cheese. Stir. Enjoy. 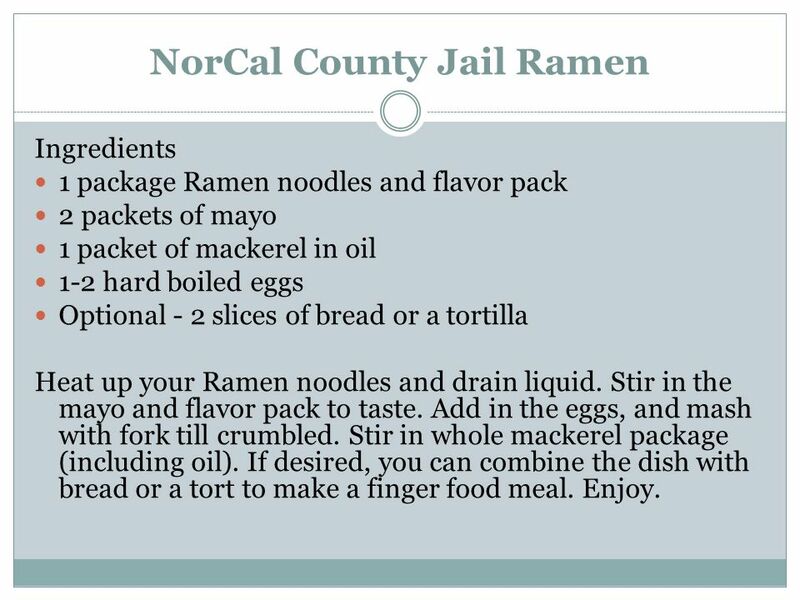 Ingredients 1 package Ramen noodles and flavor pack 2 packets of mayo 1 packet of mackerel in oil 1-2 hard boiled eggs Optional - 2 slices of bread or a tortilla Heat up your Ramen noodles and drain liquid. Stir in the mayo and flavor pack to taste. Add in the eggs, and mash with fork till crumbled. Stir in whole mackerel package (including oil). If desired, you can combine the dish with bread or a tort to make a finger food meal. Enjoy. Ingredients Beef Ramen taco seasoning 3 taco shells per pack of ramen 1 teaspoon butter per pack of ramen This was originally a crazy cooking experiment, and is surprisingly a really enjoyable way to have ramen, especially if you are on a TIGHT budget! Warm taco shells. Cook ramen to preferred softness and drain. Stir in 1 teaspoon of butter per pack of ramen into the warm noodles. Use 1/2 the amount of ramen flavoring you usually like, and then add that same amount of taco seasoning. 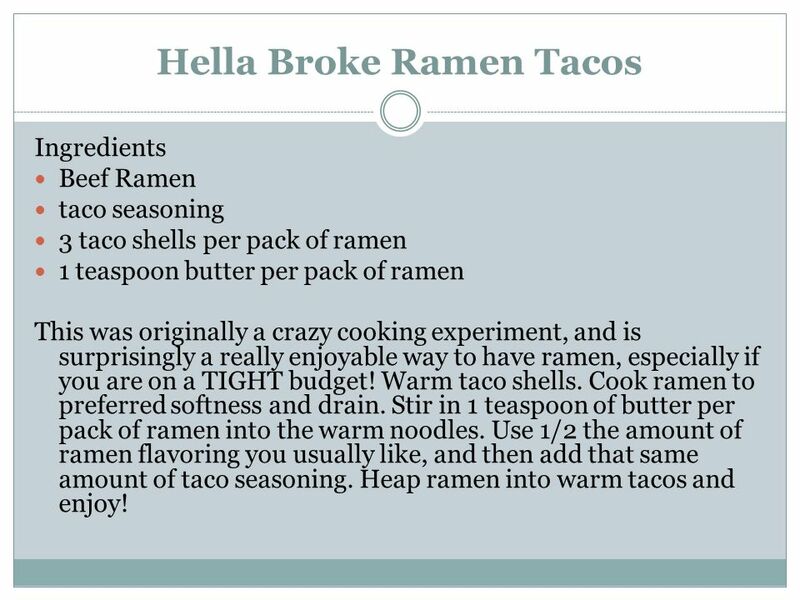 Heap ramen into warm tacos and enjoy! Curry powder (as much as you want) Black Pepper (fresh ground is better) Make the noodles as you normally would. I use less water than you are supposed to because I don’t like the soup: I like the noodles. Add the seasoning when the noodles finish cooking, and then add as much curry powder as you like. I like the flavor so I use a lot of it. After this stir it all together and let it sit for a minute or two. Then put the noodles into a bowl and add pepper on top of them (I love spicy foods so I use generous amounts of pepper, you can use however much you like.) After this stir the noodles up well and then add pepper on top of them again. Stir once more and enjoy. 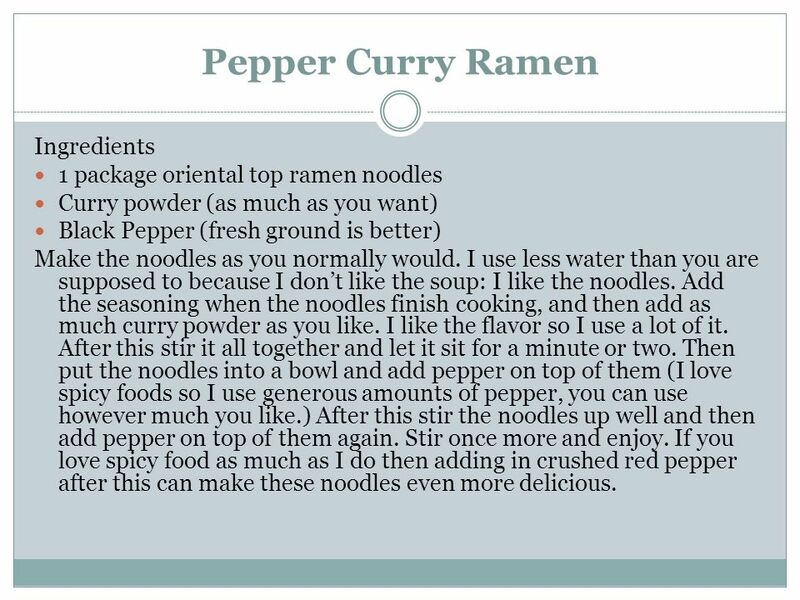 If you love spicy food as much as I do then adding in crushed red pepper after this can make these noodles even more delicious. Chopped Onions (optional) Chopped Tomatoes (optional) Worcestershire Sauce Pack of ramen Noodles First begin by boiling 2 cups of water, or use less water for a stronger broth. After the water begins to boil, add Worcestershire sauce until the flavor is strong enough for you, 2 tablespoons is a good start. (It took quite a lot for my liking.) I added the onions, tomatoes, noodles, crushed pepper (to taste), and cayenne pepper (also to taste). Let it cook as per the ramen instructions, eat, and enjoy! Authors Note: This turned out quite nice and spicy which I like. Even if you don’t like the onions and tomatoes the base tastes good on its own if you’re a fan of Worcestershire sauce. Enjoy! 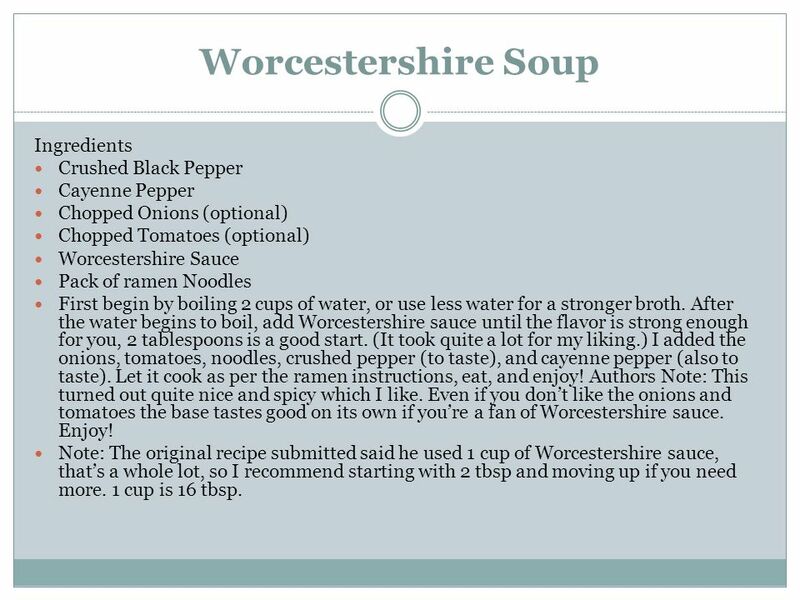 Note: The original recipe submitted said he used 1 cup of Worcestershire sauce, that’s a whole lot, so I recommend starting with 2 tbsp and moving up if you need more. 1 cup is 16 tbsp. 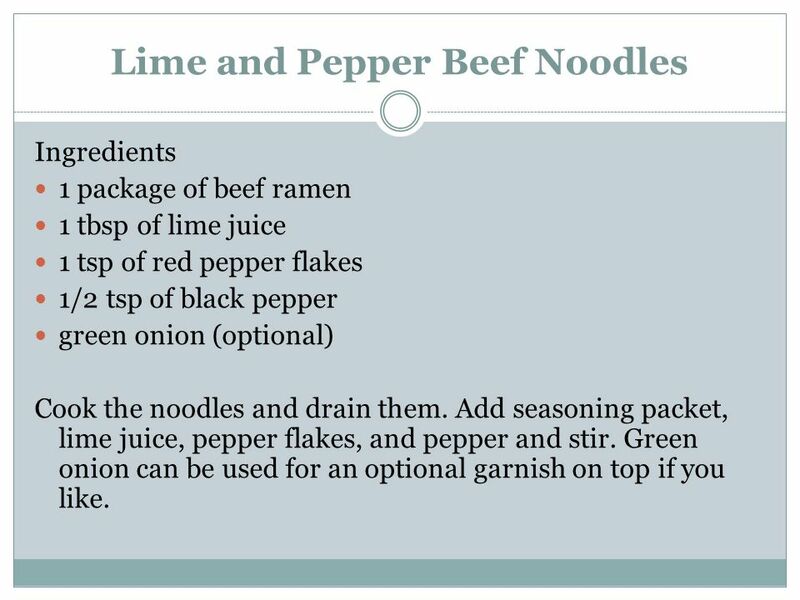 Ingredients 1 package of beef ramen 1 tbsp of lime juice 1 tsp of red pepper flakes 1/2 tsp of black pepper green onion (optional) Cook the noodles and drain them. Add seasoning packet, lime juice, pepper flakes, and pepper and stir. Green onion can be used for an optional garnish on top if you like. 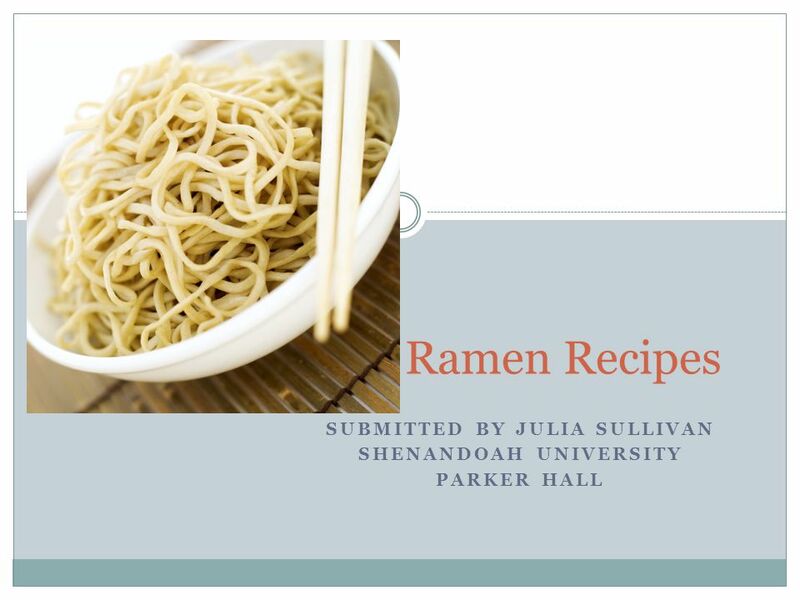 Download ppt "Submitted by Julia Sullivan Shenandoah University Parker Hall"
Casserole A casserole is a tasty blend of cooked ingredients that are heated together to develop flavor. Lesson 12 Eating out. Bowl Pitcher Cup, Half cup, Quarter of a Cup. Created by: Santolini Clarissa e Sofia Vaglio. Roast beef is a typical main course of the traditional Sunday lunch in the U.K. It is of Anglo-Saxon origins. Veggie Burgers By Jody Bertness. How to Make any Veggie Burger Without a Recipe  1) Start with some basic ingredients such as: 1can of beans, ½ cup breadcrumbs. * Example How to Make Sandwich Materials 1.Two breads 2.Strawberry jam 3.Tomatoes 4.Lettuce 5.Fried cornet. Catalan Cream  Ingredients  - 1L Milk - 6 yolks gr. sugar - 4 tablespoons cornstarch - 1 cinnamon stick - 1 lemon rind  Preparation  Boil the. Cooking for One or Two Cooking made simple. 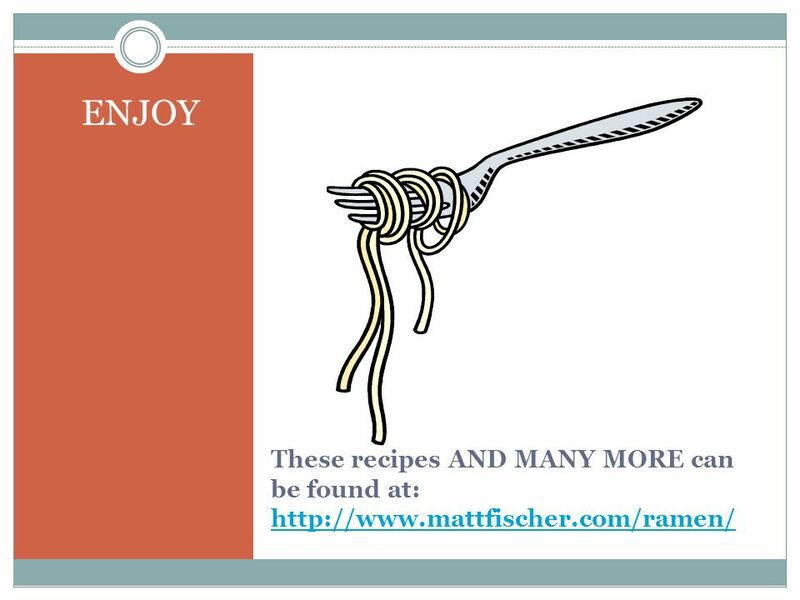 Making Mealtime Enjoyable Again Choose recipes with fewer ingredients- Saves you time and energy! Pick your. Barbeque Chicken. Types of Chicken ( Poultry) Selecting Chicken Fresh and local best Skin pink and firm Flesh smooth to touch and not sticky( indicates. Pumpkin Pasta Makes 6 servings, about 2 cups serving size Fall time is pumpkin time, make this festive pasta dish your next dinner! Recipe courtesy of. SUNDAY MENU. BREAKFAST : SOFT BREAKFAST BURRITOS Ingredients 2 vine-ripened tomatoes, seeds removed, finely chopped 1 red chilli, seeds removed, finely. What life was like… During great depression it was really hard for people to afford food. So they had to find ways to make a meal for their family! Back.